EAST LANSING, Mich. (AP) — Cassius Winston gave his offensively challenged team a needed boost. Winston scored 14 of his 23 points in the opening minutes of the second half, bouncing back from a rough start to help No. 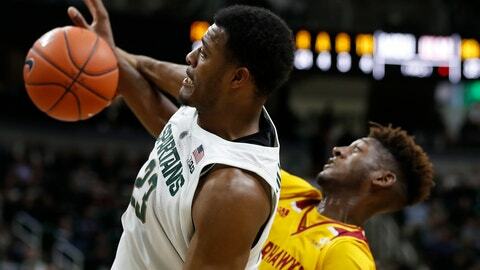 11 Michigan State beat Louisiana-Monroe 80-59 on Wednesday night. The point guard said he had to be aggressive because “we were struggling to get points on the board.” Michigan State made just 28 percent of its shots overall in the first half and was even worse on 3-pointers, connecting on 2 of 19. “I could make 2 of 19,” coach Tom Izzo said. Winston’s surge helped Michigan State lead 51-35 at the 16:52 mark after it was ahead by six points at halftime. “Cassius is capable of that a lot,” Izzo. Winston was 9 of 22 from the field, including 3 of 10 on 3-pointers, after going 2 of 9 overall and 0 for 5 beyond the arc in the first half. “I didn’t let the first half affect my confidence,” he said. The Spartans (2-1) lost Nick Ward midway through the first half with a sprained right ankle. Ward went down and pounded the court with both fists. He got up on his own and hobbled off the court, trying to keep weight off his right leg. Ward did not return after scoring four points and grabbing three rebounds in five minutes. “I don’t think it’s anything serious,” Izzo said. Joshua Langford scored 16 points while Xavier Tillman had 11 points and 13 rebounds for the Spartans. Louisiana-Monroe’s Javien Williams had 25 points. “Many times on the floor, his quickness bothered Michigan State, no matter who was guarding him,” coach Keith Richard said. Michael Ertel added 20 points for the Warhawks (2-2). Louisiana-Monroe was without Daishon Smith, who averages 17 points, for the second straight game because of a hamstring injury. “We played without one of our better guards,” Richard said. Louisiana-Monroe: Leading the 11th-ranked team on its home court — as the Warhawks did in the first half for 1:27 — will be something they can look back on with pride. Michigan State: The Spartans hope Ward’s injury proves to be little more than a scare. Louisiana-Monroe lost forward Tyree White midway through the second half due to an ejection that followed a flagrant foul for an aggressive box out. Richard said the rule is, and Izzo agreed. “I don’t know how little guys are going to box out big guys,” Izzo said. “I’m just worried that’s going to happen to someone in a big game when it’s unintentional. White will have to sit out the team’s next game. Michigan State freshman Foster Loyer made two shots and missed two attempts, sailing them over the rim. “I have never missed two like that,” he said. Louisiana-Monroe gets some time to prepare for its next game on Nov. 23 at Tennessee Tech. Michigan State hosts Tennessee Tech on Sunday night.